Not to be confused with デストロイマーチ. ストレイ・マーチ is part of wac's Zodiac series of songs, representing Aries. ストレイ・マーチ is the final unlockable song of the second Phase of REFLEC BEAT colette -Spring-'s Pastel Adventure colette Garden unlocking system. To obtain it, you must have bloomed the Rose-shaped Seed (バラに似たたね). From REFLEC BEAT groovin'!! to REFLEC BEAT VOLZZA 2, ストレイ・マーチ was playable by default. The alias used by Jun Wakita in ストレイ・マーチ, Shounen Zodiac (少年ゾディアック), is a combination of his Shounen Radio (少年ラジオ) and ZODIACSYNDICATE aliases. ストレイ・マーチ is wac's first non-collaboration original song in the REFLEC BEAT series. 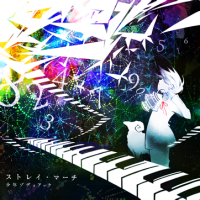 It also marks the first original song by Yu Tokiwa in the REFLEC BEAT series. ストレイ・マーチ can be unlocked in jubeat saucer from June 12th, 2013 as part of the Pastel-kun to Smith-shi no RUNRUN marathon! (パステルくんとスミス氏のRUNRUNマラソン!) crossover event with REFLEC BEAT colette. It is the third unlockable song of the 3rd Meeting, after Pastel-kun completes 45 laps around the track. ストレイ・マーチ appears in pop'n music Sunny Park as part of the Q-pro, Mimi, Nyami & Pastel-kun no minna de uchuu sensou!! (クプロ・ミミニャミ・パステルくんのみんなで宇宙戦争!!) unlock event, which started on July 29th, 2013. In pop'n music ラピストリア, it could be unlocked through the Hakken! Yomigaetta BEMANI iseki (発見！よみがえったBEMANI遺跡) event. From July 23rd, 2015, it could be unlocked in pop'n music ラピストリア via Story Mode. The genre of ストレイ・マーチ, ZODIAC ORACLE 1, refers to the first astrological sign in the Zodiac, Aries; the Sun enters the sign period on 21st March. Hamal, also known as Alpha Arietis, is the brightest star in the northern zodiacal constellation of Aries. Sheratan, also kwown as Beta Arietism is a binary star system in the constellation Aries, marking the Ram's second horn. Mesarthim, also known as Gamma Arietis, is a binary star system in the northern constellation of Aries. Though unwritten in the lyrics, there is a faint sample of Yu Tokiwa saying "Count sheep" at the beginning and counting to 90, counting up by 1 for each measure until the end of ストレイ・マーチ. 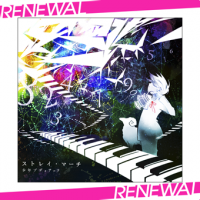 ストレイ・マーチ received RENEWAL charts in REFLEC BEAT VOLZZA, unlockable as part of the fourth phase of the Pastel-kun to Gakkii-hakase no dokidoki rhythm kenkyujou (パステルくんとガッキー博士のドキドキリズム研究所) event. They could be unlocked after assembling the Baa baa Piano (メェ～メェ～ピアノ) instrument. In jukebeat and REFLEC BEAT +, ストレイ・マーチ's title and artist were changed to stray march and kid zodiac, respectively. After being removed from the initial release of REFLEC BEAT 悠久のリフレシア, ストレイ・マーチ was revived on March 1st, 2018. This page was last edited on 20 February 2019, at 17:38.